Many people -- including celebrities -- have spoken out on the horrific tragedy that struck Newtown, Conn., on Friday, when a 20-year-old gunman opened fire and killed 26 people, including 20 children, at Sandy Hook Elementary School. 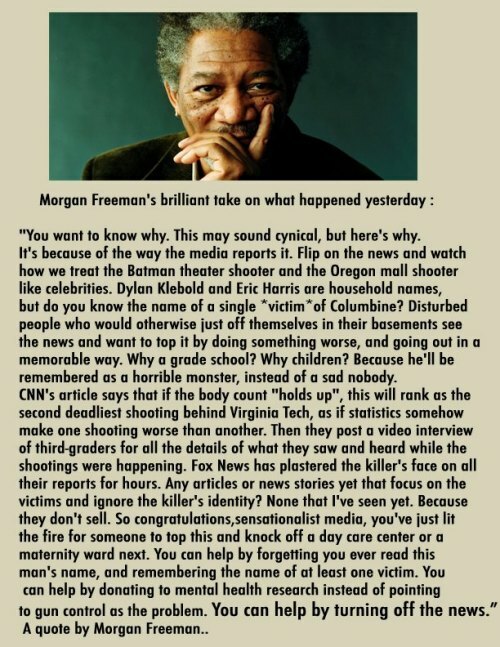 The lengthy quote attributed to Freeman is indeed a hoax. 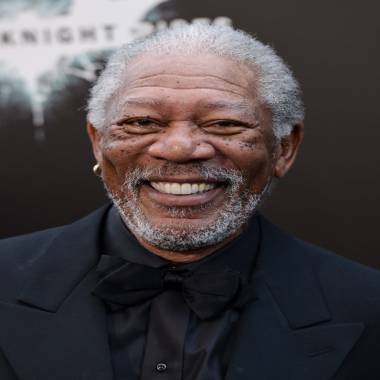 "Morgan neither made statements or posted those statements. We are trying to find out who did, but they did not originate from him," the actor's rep told E! News. So what did the Oscar winner allegedly say? The remark floating around online that was said to be from Freeman stated the following: "You want to know why. This may sound cynical, but here's why. It's because of the way the media reports it. Flip on the news and watch how we treat the Batman theater shooter and the Oregon mall shooter like celebrities. Dylan Klebold and Eric Harris are household names, but do you know the name of a single victim of Columbine? Disturbed people who would otherwise just off themselves in their basements see the news and want to top it by doing something worse, and going out in a memorable way. Why a grade school? Why children? Because he'll be remembered as a horrible monster, instead of a sad nobody." The falsely-attributed quote continued, "CNN's article says that if the body count 'holds up,' this will rank as the second deadliest shooting behind Virginia Tech, as if statistics somehow make one shooting worse than another. Then they post a video interview of third-graders for all the details of what they saw and heard while the shootings were happening. Fox News has plastered the killer's face on all their reports for hours. Any articles or news stories yet that focus on the victims and ignore the killer's identity? None that I've seen yet. Because they don't sell. So congratulations, sensationalist media, you've just lit the fire for someone to top this and knock off a day care center or a maternity ward next. You can help by forgetting you ever read this man's name, and remembering the name of at least one victim. You can help by donating to mental health research instead of pointing to gun control as the problem."